naijablog: Picture from outside a Lagos mosque.. Whether this image is a fake or not, what is shocking is that we can imagine it to be true. In other words, we can imagine a world where the bonds of trust in society have broken down so much that muslims at the mosque might want to steal each other’s footwear. Lagos: a city of absurd tragic-comic contradictions in a country of enormous tragi-comic proportions. I think this is just to make sure that the owner does not end up putting his feet into slippers that are not a matching pair and to help him identify his slippers from the multitude of footwear on a busy prayer day. The security aspect is just a bonus, the trust aspect is a tad too cynical. Give humanity a bit of slack, come on. Jeremy. i doubt the security aspect too, afterall you can easily pick that brand of slippers on the streets of lagos, almost for free. I love the philosophical implications of this picture: poems, dissertations, and white papers could be written a-plenty. 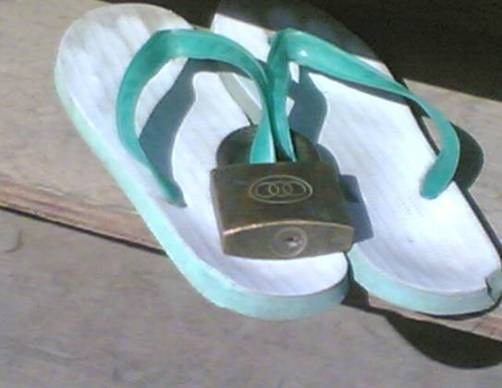 People's King James Versions get stolen all the time in churches, armed robbers steal from churches, what's so outrageous about someone securing his Friday best flip-flops?